Is there a forth type of cloud on the horizon? Certain conditions must exist for clouds to form – water vapor in the air, temperature change, and particles in the air for the water vapor to condense on. As warm, moist air rises, it begins to cool and condense on dust particles forming water droplets. These water droplets form clouds. They will not fall to Earth because they are too small. There are three main types of clouds. Clouds take different shapes depending on the amount of water vapor available and the speed and direction of the moving air. 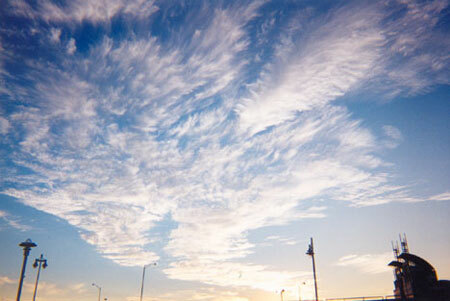 Clouds are classified according to how they are formed. Below are the main types and their descriptions. 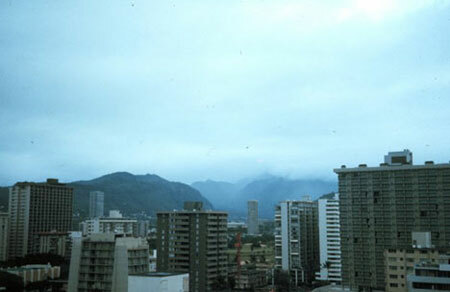 Stratus clouds are low, flat, gray clouds that look like sheets covering the sky. They are the closest clouds to the ground. They form as low as surface level (fog) to about 6,500 feet above the ground. They can produce rain, drizzle, snow, or mist. 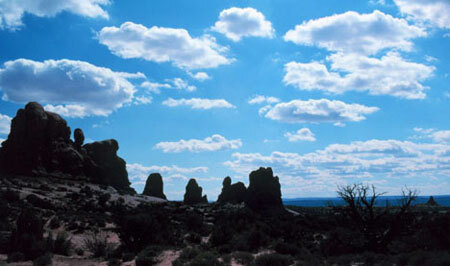 Cumulus clouds are puffy and white-like cotton balls. They form from 2,000 to 20,000 feet above the ground. They usually indicate fair weather. Sometimes they grow very large and become thunderheads. As these clouds gather they create thunder and lightning and produce precipitation in the form of rain and hail. Cirrus clouds are thin, curly, wispy clouds. They are sometimes referred to as mares’ tails. They form between 25,000 to 40,000 feet above the ground. They are so high in the atmosphere that the water droplets freeze into ice crystals. They often indicate an incoming storm or weather change. There are cloud charts that you can buy to show what these clouds look like. However, most cloud charts will have more than these basic clouds. They use the prefixes “alto” and “nimbo” to tell more about these three basic clouds. If the prefix “alto” is used, it means middle, referring to the position of the clouds in their respective areas. If the prefix “nimbo” is used, it means water and these clouds will often bring rain. Download a cloud chart showing high, middle and low cloud formations. Download a cloud tracking chart and keep track of the types of clouds in your sky. Can you start to predict what will happen? Find out now. 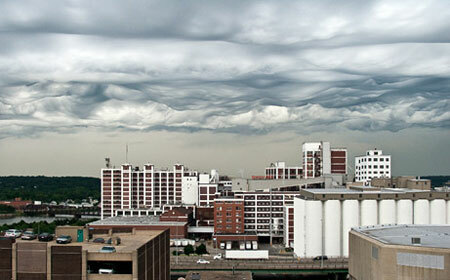 June 3, 2009–These choppy clouds over Cedar Rapids, Iowa, in an undated picture could be examples of the first new type of cloud to be recognized since 1951. Or so hopes Gavin Pretor-Pinney, founder of the Cloud Appreciation Society. The British cloud enthusiast said he began getting photos of "dramatic" and "weird" clouds (including the above) in 2005 that he didn't know how to define. A few months ago he began preparing to propose the odd formations as a new cloud variety to the UN's World Meteorological Organization, which classifies cloud types. Pretor-Pinney jokingly calls it the "Jacques Cousteau cloud," after its resemblance to a roiling ocean surface seen from below. But the cloud fan has proposed a "formal," Latin name: Undulus asperatus–roughly, "a very turbulent, violent, chaotic form of undulation," explained Pretor-Pinney, author of the new Cloud Collector's Handbook. Margaret LeMone, a cloud expert with the National Center for Atmospheric Research in Boulder, Colorado, said that she has taken photos of asperatus clouds intermittently over the past 30 years. It's likely that the cloud will turn out to be a new variety, LeMone said. "Having a group of people enthusiastic about clouds can only help the field of meteorology," she added. Asked how has such a striking cloud type could go unrecognized, Pretor-Pinney cites its rarity–and the proliferation and portability of digital cameras. "Technology has allowed us to have this new perspective on the sky." Next post: Do celebrities really die in Threes?